Every time I see the Scion tC, one thought comes to my head. It's kind of like the Infiniti G37 on a budget. Sure, the tC is a front driver, but for some reason I see a similarity. There is now a new tC, and it still looks like the G37's gateway drug. Last week I questioned why the tC still exists when Scion has the FR-S, and a lot of you came back with some great answers. Mainly, it's cheaper and fits an entirely different market than the FR-S. It's people that aren't necessarily looking to drift around, but still want something pretty cool. The G37 is the calmer, yet still boy-racery cousin of the 370Z, so this makes sense. This new tC has a few styling tweaks from the last car to update it. Mainly, you have angrier headlights, new grille, new bumpers, and yes, LEDs. The 2.5 liter four has 172 horsepower and 172 pound-feet of torque, which makes this one of the few cars with equal amounts of grunt and thrust. Funnily enough, Scion's website says the car has 179 horsepower, and the printed material from the show says 172. And then there's the "10 Series" models of every car in the Scion lineup. 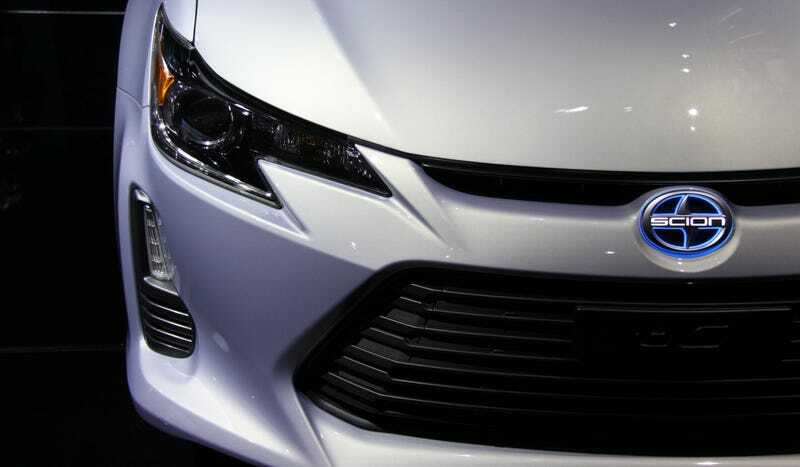 Each car has LEDs in the Scion emblem that light up when you unlock it, silver paint, silver seatbelts, illuminated dash, and a solar powered (!) illuminated (!!) shift knob. Scion will only make 10,000 10 series editions across all of its models. Better saunter on down to the Scion dealer now.